Computer-Assisted Surgery (CAS) is a new tool for performing complex procedures in a predictable and safe way. 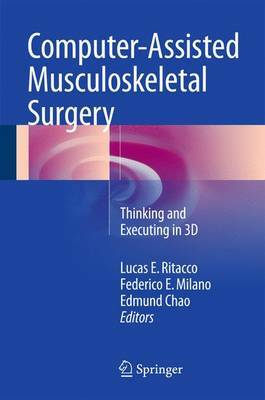 This book is designed to serve as a comprehensive review of Computer-Assisted Surgery, covering the current status of both research and applications. CAS includes Virtual Preoperative Planning (VPP) and Intraoperative Virtual Navigation (IVN), which are a set of technologies used to measure oncological margins in 3-Dimensions (3D), to locate small intraosseous tumors and apply controlled resections preserving anatomical structures. During VPP, patient acquired multimodal images are processed and an interactive virtual scenario is created. This can then be used as a platform to measure oncological distances and preplan osteotomies in safe areas. IVN is a procedure which allows the execution of the VPP with a mean error of less than 3mm. For the student, medical doctors, research and development scientists or new researchers, the protocols are central to the performance of Computer-Assisted technologies.